Only Iran, North Korea, and Pakistan are viewed in a more negative light than Israel, according to a poll conducted in 28 countries and published Tuesday by the BBC. The poll shows that just 19% of the 29,000 respondents questioned view Israel positively versus 50% who perceive the country in a negative light. 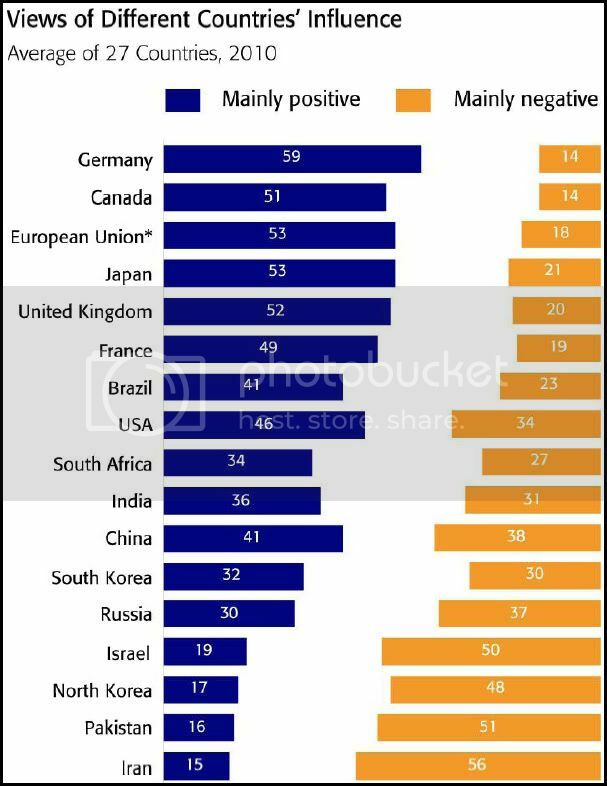 Together with Israel at the bottom of the list are Iran (15% positive, 56% negative), Pakistan (16% positive, 51% negative), and North Korea (17% positive, 48% negative). The poll also showed that world perceptions of the US are improving with 46% of respondents viewing the country favorably and 34% viewing the country negatively. Only two countries saw a decrease in the perception of the world's number one superpower – Turkey and India. Topping the list of "America haters" are Turkey, with 70% of its respondents viewing the US unfavorable, and Pakistan, with 52% viewing the US negatively. Support for the US dropped surprisingly in India, from 43% to 39%. "People around the world today view the United States more positively than at any time since the second Iraq war," said Doug Miller, chairman of international polling firm GlobeScan, which carried out the poll with the Program on International Policy Attitudes (Pipa) at the University of Maryland. He noted that the "Obama effect" apparently is a real thing. Pipa director Steven Kull noted: "After a year, it appears the 'Obama effect' is real. According to the poll, the most favorable viewed countries are Germany (59%), Japan (53%), Britain (52%), Canada (51%), and France (49%). As Simple as A, B, C!